Supporters of artists urged to attend City Hall hearing on Dec. 7. The Los Angeles Cultural Heritage Commission will again hear testimony about the status of the 800 Traction Ave. building on Thursday, Dec. 7, from 10 a.m. to 12 p.m. in Room 1010 at City Hall, 200 Spring St., Los Angeles. At issue is the impending eviction of artists, some of whom have lived at the building for decades, by the new owner, DLJ Real Estate Capital Partners. Members of the Arts District and Little Tokyo communities have been resisting the evictions for the past four months. According to the 800 Traction Ave. Support Committee, “They have contributed to the prosperity of the Arts District and the cultural life of Little Tokyo for years … The owners want to kick them out and turn a profit. “DLJ applied for ‘cultural historic monument’ status for 800 Traction, once a famous coffee and spice factory, so they can get millions in tax breaks once the tenants are gone. 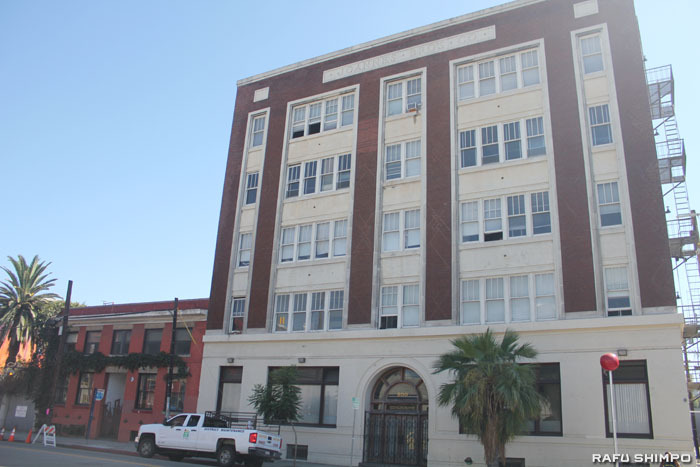 It is one of the first artist-in-residence buildings remaining in today’s Arts District. 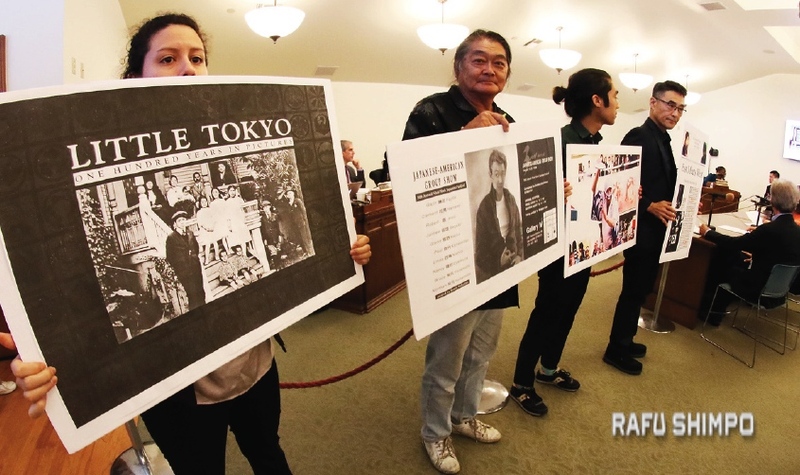 “On Oct. 5, the L.A. City Cultural Heritage Commission told DLJ to work with the community to gather the history of Japanese American artists/residents of the building in response to the community who protested DLJ’s omission [of that information in its initial application]. “We do not feel that GPA did the research required to complete this task properly and they ignored requests and suggestions made by community representatives for how to do so. In their recently submitted 12-page memo, they identify historical facts, but sanitize them by failing to mention context or social cultural impact of work and activity originating at 800 Traction Ave. They did not even interview any of the longtime resident artists still living in the building. They did not contact Rafu Shimpo. The committee said in a statement, “Imagine that Miles Hamada never created any of his silk-screened community event posters and T-shirts over the past 40+ years. Imagine that Miles hadn’t taught the thousands of people Japanese folk dancing over the years. Imagine that none of Nancy Uyemura’s public artworks were created (e.g. Casa Heiwa entry, or paintings in the Little Tokyo Library and ‘art boxes’ of Little Tokyo walkways. Miyagawa added, “We do not think it is morally or ethically proper to arbitrarily characterize that the history of the building prior to 1980 is more significant than the human history of the building for the past 37 years. In fact, the documentation we have of this activity, including that of Japanese American artists, is far more broad and extensive than anything that GPA Consulting has come up with to defend their arguments to dismiss this history. For more information on efforts to support the artist/tenants, email [email protected] or visit www.facebook.com/StandWith800Traction/.